Size: Maximum size: 40 cm weighing 1 kg. Seldom more than 30 cm. The biggest are females. Biology: The dab is found on shallow waters and down to 100 meters depth. It’s not easy to spot as it covers it selves with sand and mud. Some dabs may look like a carrelet, having the same orange or yellow spots on the skin on the eye side. While the carrelet has a soft and smooth skin on the eye side, the dab is covered with tiny scales giving the skin a rougher surface. The skin feels almost like sand paper. The dab is normally brownish in color with shades of orange and grey. It is common along the entire Norwegian coastline, though in areas with sand og mue bottom. On shallow waters you are most likely to find the youngest (smallest) dabs. A dab can reach the age of ten. Fishery: In Norway there are no specialized commercial fishery for dab. 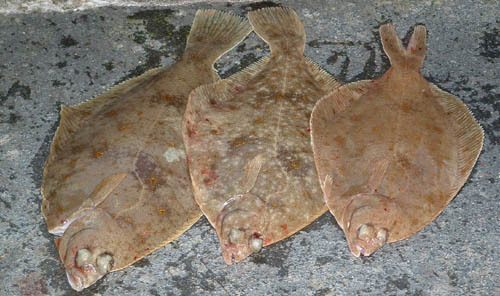 In other countries near the North Sea the dab is a popular and commercial important specie. The dab is then mainly caught by using trawl and by fly-shooting. Some fishermen are also using fishing nets and seine. The dab is a popular fish among anglers and the meat tastes good. 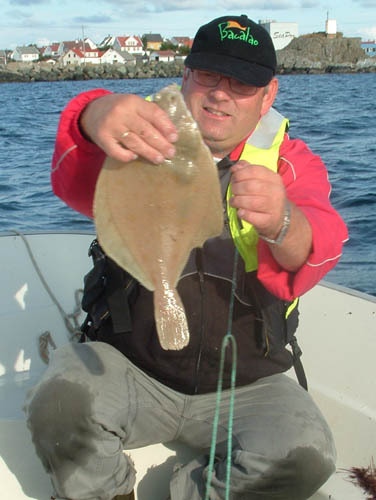 Dab caught on longlines on 25 meters depth outside Karmøy in Norway..
Three dabs caught on shallow water (18 - 25 m.). The one to the left has yellow spots on the skin. Dabs ready to cook in the owen or to fry on a pan. 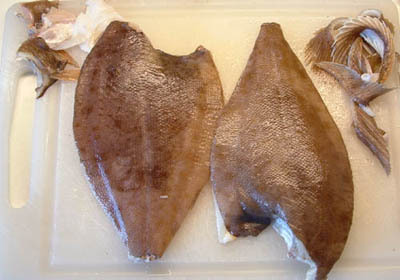 The fins are cut of. Read about it in Norwegian.